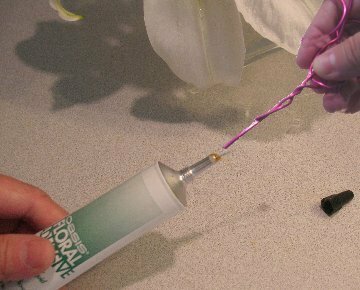 Squirt some Oasis Floral Adhesive onto the end of the twist before inserting into the foam. This adhesive locks into the foam even when wet and holds secure in refrigerated conditions. Hot and cold glue becomes brittle in refrigeration and does not always hold well in wet circumstances. 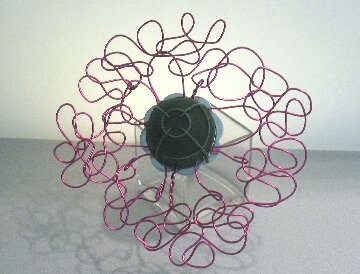 Insert the twisted wire deeply into the foam, so to attach the pink bouquet collar firmly on both the top and bottom. 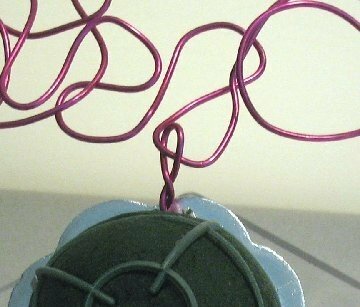 Your wire collar should now be attached at the top and bottom. 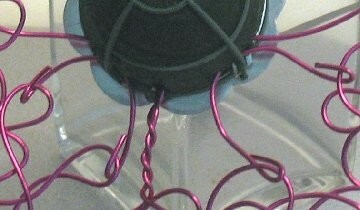 The other wires are going to be attached differently. Pinch one end around a loop on the collar. 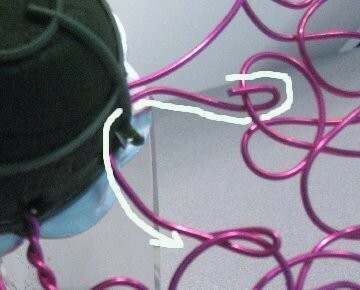 Thread the wire through the actual cage of the foam head, back out and pinch the other end of the wire around another loop. Needle nose pliers can help get a tight pinch. This is how it looks from another angle. Repeat all around the bouquet, making sure that the bouquet collar is securely attached to the holder. When finished, it should look like this. 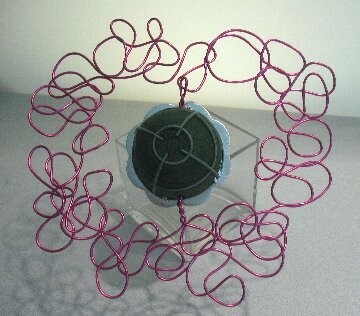 The wire frame should be fairly steady without flopping around loosely when you hold the bouquet. 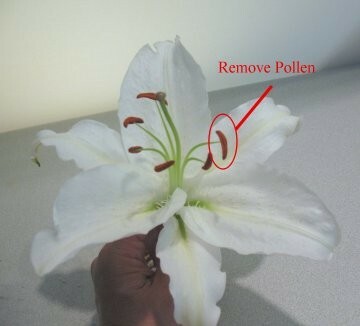 You should always remove the pollen from the blooms. This is easier to do before the stamens become mature (fuzzy and bright yellow). If you don't remove these, they can stain the flower, your dresses, carpeting and more. Cut the stems to about 1 1/2" long. 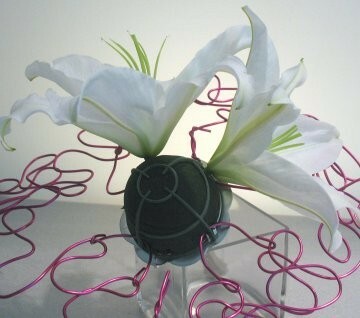 Insert each lily deep into the foam, so that the head rests right above it. Handle the flower head gently, pushing from the inside down if you need to. 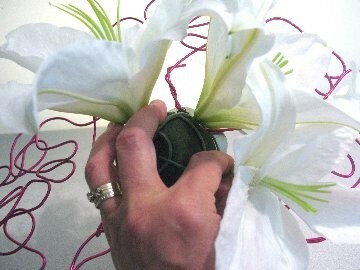 Be careful not to split the flower open or break the petals loose from the stem. 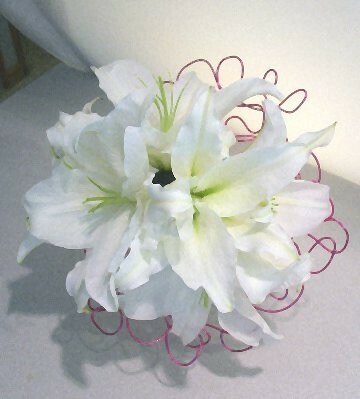 Face the lilies outward around the outside diameter of the bouquet. 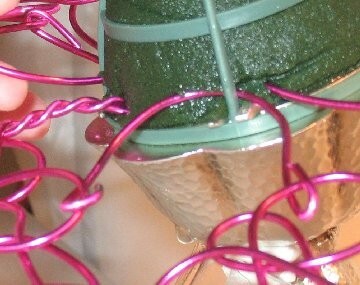 You can also grasp the stem with your fingers right under the flower head, helping to push it deep into the Oasis. 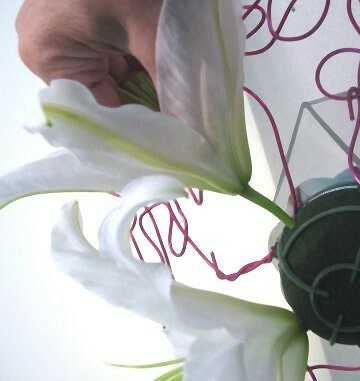 Continue to fill in the bouquet, gently crowding the lilies close together so that all the foam is covered and you can't see the mechanics of the bouquet. 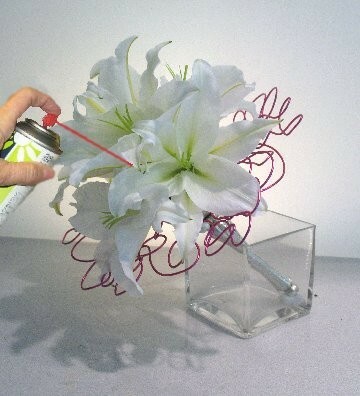 The final step is to secure the flowers with Floralock Stem Adhesive. I love this product, since it is much easier (and less messy!) than tube glue. 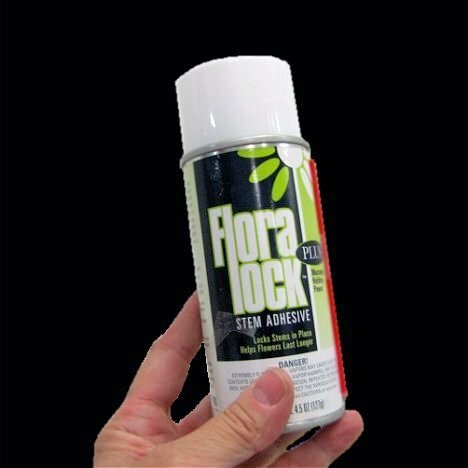 Floralock Adhesive is done last, after you are sure your design is complete. 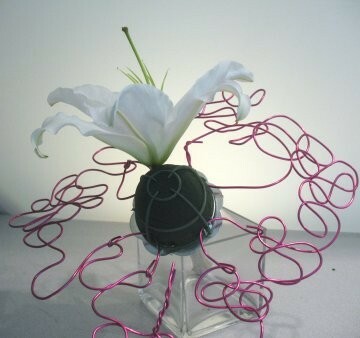 It creates a seal over the foam and will make it hard to insert any more flowers into the Oasis. I use Finishing Touch on every flower design, misting it well and allowing it to dry before refrigeration. 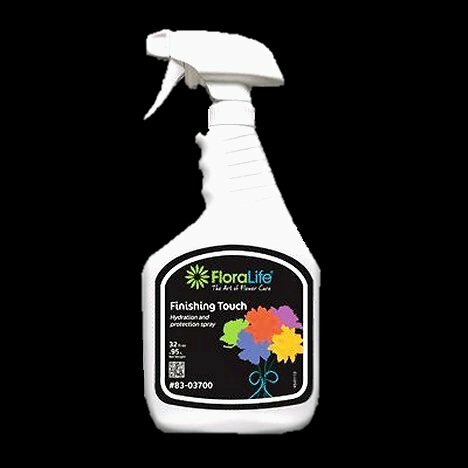 This helps lock in moisture into the petals and reduces evaporation. Household air conditioning and refrigeration are designed to pull moisture from the air, while professional floral coolers put moisture into the air. Finishing Touch helps counteract this process. Please feel free to explore the other flower tutorials, filled with step by step photo tutorials and how to design like a professional florist.